We value those food memories reminding us of home and family. When holidays inch closer, we love celebrating long-standing traditions like warm, comforting sprouted whole wheat dinner rolls. 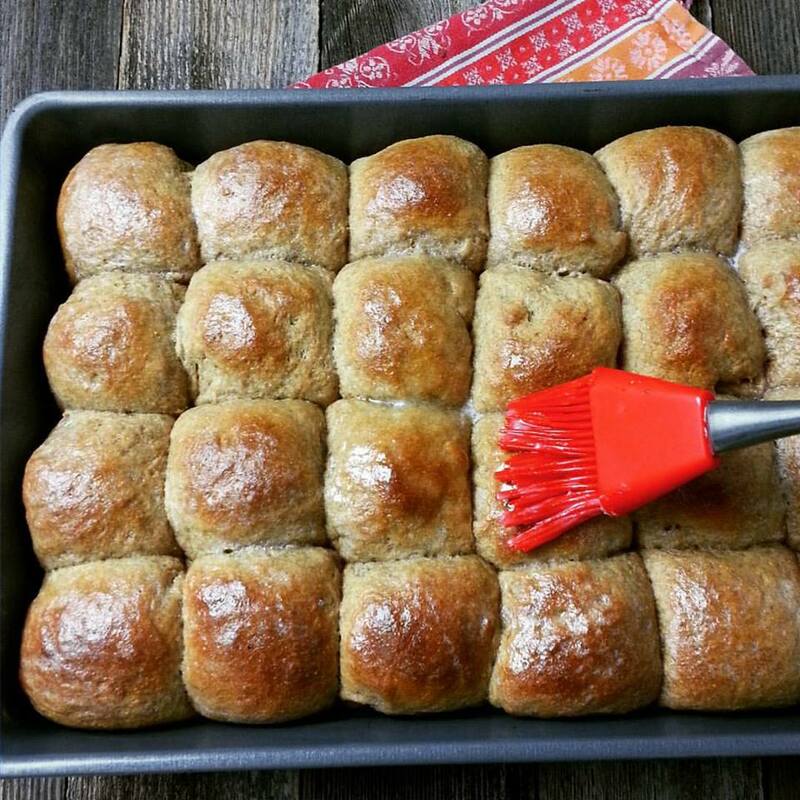 Dinner Rolls made with White Winter Wheat are lighter in color and flavor. Back when I was a child, sliced sandwich bread was on the table at every meal, but at Thanksgiving and Christmas, my mom made the extra effort to make homemade rolls. I can still remember her brushing melted butter over the warm rolls to make the tops glisten and keep them soft. Sprouted Whole Wheat Dinner Rolls are my updated version of Mom’s dinner rolls. The bonus here is being able to pass them along with a healthier twist. 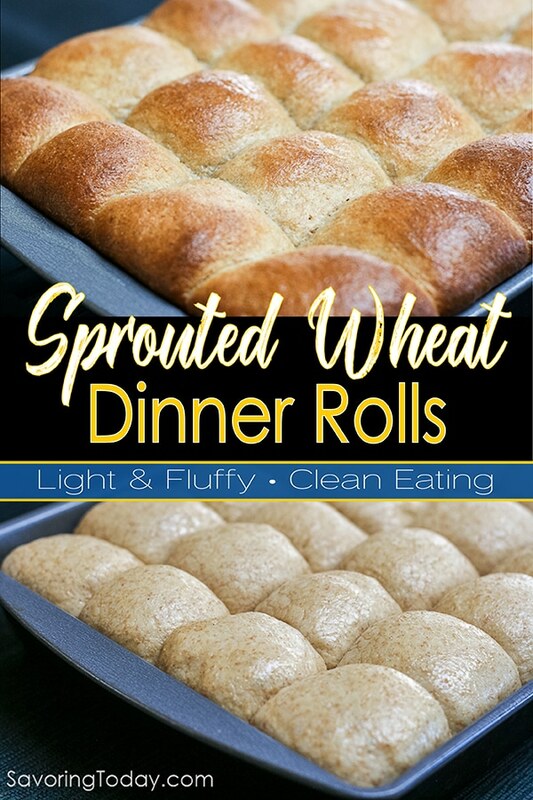 These Sprouted Whole Wheat Dinner Rolls are amazingly light and delicious. Foodie that I am, it is vital to prepare food that is not only healthy, but tastes good too. Most truly whole wheat products out of the store are heavy, dense, or dry. Not so with these homemade beauties. I’ve been working with sprouted wheat flour long enough now, I’ve learned the secrets to creating soft, fluffy whole wheat breads like this one. You can make this recipe with any sprouted whole wheat flour. However, I highly recommend the white wheat variety, which is what I used in the video above. White and red wheat have the same levels of nutrition, but white has a sweeter, mild flavor (less wheat-y) and produces a lighter texture in softer baked goods like rolls and pastries. For more detailed information on working with sprouted wheat flour, check out my Sprouted Wheat Cinnamon Roll Recipe. Light, soft homemade dinner rolls made with 100% sprouted whole wheat. In the bowl of a stand mixer, sprinkle yeast over warm milk. Let stand until softened, about 5 minutes. Stir in the butter, honey, eggs, salt and half of the flour and mix until smooth. Allow dough to rest for 10 minutes. Stir in the remaining flour 1/2 cup at a time until a soft, sticky dough forms, about 5 minutes. The dough will look shaggy and move slowly off the beater, but should be able to hold its shape -- it will stabilize more through the folding process. Spread 2 tablespoons of oil on a flat work surface in a 15-inch circle. Turn dough out onto the oiled surface and with oiled hands or a dough scraper, lift and fold the dough over on itself 4 or 5 times--you should notice the dough is very soft, but able to hold shape (not runny). A dough scraper makes it easy to lift and fold the dough. A Cover with a bowl and allow to rest for 5 minutes. Repeat the folding and resting process 3 more times--a total of 4 folding sessions with 3 (5-min) resting times in between. Punch down dough and let rise for one more hour. Butter two 9x11 metal baking pans or line with parchment (the number of pans will depend on the size/number of rolls. Using a kitchen scale, weigh the dough. Divide the dough weight by the number of rolls you desire. (The easiest way to make sure all the rolls are the same size is to use a kitchen scale.) With a little oil on your hands, pinch off and weigh out the rolls. Sprouted wheat dough can be sticky, so continue to apply oil throughout the shaping process as needed. Shape each ball of dough in your hands by folding edges into the middle so the top side is smooth and place in the pan 1/4" apart. It's okay to crowd the rolls so they will touch when risen producing soft sides that easily peel away from each other when baked. Cover and let rise for 30-40 minutes until doubled in size while preheating the oven to 375°F. Bake for 18-20 minutes, or until golden brown (the internal temp should reach 190°F using an instant-read thermometer). Remove from oven and brush tops generously with melted butter and sprinkle with flaky sea salt. Allow to rest 5 to 10 minutes before serving. Any sprouted whole wheat will work for this recipe, but white whole wheat or whole wheat pastry flour will produce the lightest rolls. IMPORTANT: “Holds its shape” means the dough may still slump or spread slightly when placed on the counter, but isn’t runny. This is important because once the dough can sit in a shaggy lump, only relaxing slightly, you can stop adding flour and switch to oil for handling the dough through the folding process. Through the folding and resting process, the dough will continue to hydrate and stabilize. Why are Sprouted Whole Wheat Dinner Rolls better? Sprouting naturally manufactures vitamin C, increases vitamin B, carotene levels, and minerals. Sprouting initiates the digestion process, breaking down the complex sugars, which make digestion easier and the vitamins and minerals more bio-available. Sprouting neutralizes enzyme inhibitors and reduces phytic acid (an anti-nutrient) that inhibits absorption of calcium, magnesium, iron, copper, and zinc. Sprouted wheat is NOT gluten-free and not safe for those diagnosed with celiac disease. However, because of its lower starch content, some people who are gluten-sensitive are able to eat sprouted flour. Sprouted Wheat Rolls made with red winter wheat instead of white winter wheat. I have used a wide variety of sprouted wheat flour and encourage you to keep in mind they are all different; Some absorb moisture more quickly or are more finely ground. As I mention in my Cinnamon Roll Recipe, there is a difference in flavor between the red and white varieties. As this time, prices start around $2.47 per pound and go up from there, but there’s more to the story than the price. It is the shipping costs that can bite so look for shipping discounts or free shipping for the best deal. This is not an exhaustive list of sources, just the suppliers and brands I have experience using and can personally recommend. All are organic and Non-GMO. Their sprouted white wheat flour brand has become my new favorite. It has the silkiest, most finely ground texture of any I’ve tried, which makes beautiful cinnamon rolls like these. It is only available through Thrive Market, a membership community for purchasing health food and natural products at wholesale prices. They offer a free 30-day membership trial and you can cancel any time. Annual membership is $59.95 and they guarantee your annual membership will pay for itself in savings. FREE SHIPPING on all orders over $49. Their flour is among the lowest priced and some of the best I’ve used. I have used a variety of sprouted flours from this company and love the fact I can choose from so many. To Your Health offers sprouted white wheat flour on their site, as well as on Amazon with the price (and shipping) consistent on both. The flour is also finely ground and I have had great results every time I’ve used it. Their products are available at Whole Foods Market from time to time, so I always check when I’m there. For behind the scenes look, check out a brief tour of their plant on The Kitchn. This company has a great small farm story and I’ve had great results with their flours too. They also offer a nice variety of sprouted grain flours, including ancient grains like khorasan (Kamut). White wheat flour is not part of their product line at this time, however their red wheat flour is superb. You can find their sprouted whole wheat flour on the shelves at Whole Foods Market or online at Amazon, which usually has shipping deals making online ordering the better way to go. One more thought on price—sprouted flour will always cost more than refined all-purpose flour, but that’s a good thing. This is good because it is a helpful reminder that even healthier carbs should still be a small part of your overall diet. Gotta love home made rolls like these ones.. LOVE the golden colour on the tops..
Slathered with a little grass-fed butter.. mmm Heavenly!! Homemade rolls are so much better than store-bought and this looks like a great recipe for Thanksgiving! I can smell them through your photos! These rolls are PERFECT! 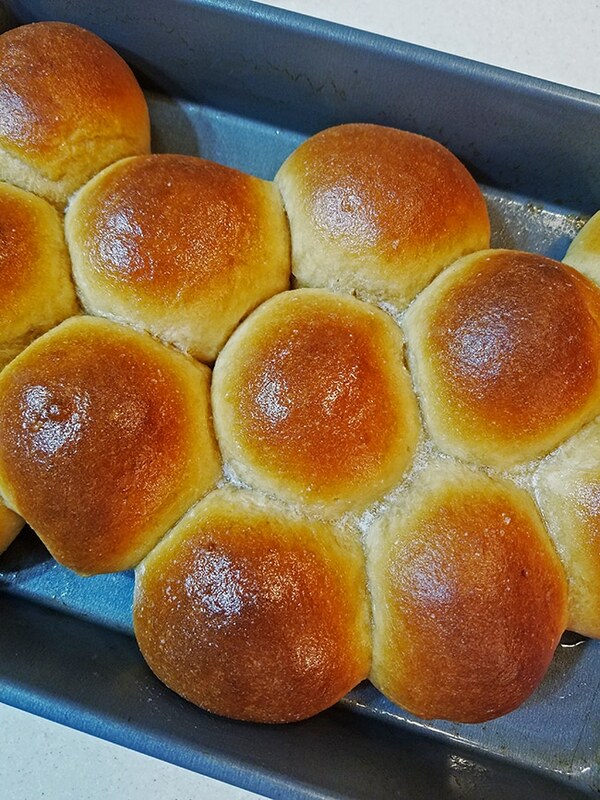 They remind me of the dinner rolls my husband’s grandmother makes! And that’s a compliment! Pinned too! These look so very beautiful! I am definitely treating myself to some of these for Thanksgiving! Wow these rolls are beautiful! Love that golden brown color on the tops and that you use sprouted whole wheat, so much better than regular. Such a great healthy dinner roll recipe! I need to try this. Those look delicious! I bet my family would love these. I’m passing this recipe along to a friend of mine who loves to have bread made from sprouted wheat. I know she would enjoy these during the holidays. Have never worked with sprouted wheat before but it looks like I should. There is nothing better than warm homemade bread right out of the oven and looking at the rolls, I just want to grab one, slather it with butter and enjoy. Very nice recipe! LOVE soft rolls like this. Too much. 🙂 We haven’t really worked much with sprouted wheat flour — really should spend some time getting to know it. And start by making these rolls, of course! Wow, those look so much better than storebought! It looks wonderful. i would love to try this recipe soon! This roll looks yummy and perfect. I already imagined the smell of that freshly baked in the morning with melting butter! Healthy food should be a choice for everybody. These rolls look perfect for the festive table.